Plagiarism Can Students Recognize It? How to Recognize Plagiarism: Plagiarism Test The following form/test is taken from Indiana University's School of Education (with permission, of course). The original test and resources can be found here with additional resources regarding plagiarism found in the sidebar of that page. Academic Integrity You must successfully complete this form by 11:59 p.m. on Friday, September 18, 2015, at which time the form will close. Students who do not successfully complete this form will be held from registering for Spring 2015 classes. Please contact the Office of Student Affairs, at [email protected] if you have any questions. Plagiarism Test For the following items, the original source material is given along with a sample of student work. Determine the type of plagiarism by selecting your choice from options given. Please note: If the student version contains BOTH word-for-word and paraphrasing plagiarism, you should check word-forword. Also, when Reference(s) are included following the example passage, that indicates the work was properly cited in the bibliography/end notes. Following your responses to each question, you will be prompted you to check the "I Agree" box to confirm that you have read and understand the material. You must check this box before proceeding to the next question. Original Source Material Student Version Developing complex skills in the classroom involves the key ingredients identified in teaching pigeons to play ping-pong and to bowl. The key ingredients are: (1) inducing a response, (2) reinforcing subtle improvements or refinements in the behavior, (3) providing for the transfer of stimulus control by gradually withdrawing the prompts or cues, and (4) scheduling reinforcements so that the ratio of reinforcements in responses gradually increases and natural reinforcers can maintain their behavior. Source: Gredler, M. E. (2001). Learning and instruction: Theory into practice (4th ed.). Upper Saddle River, NJ: Prentice-Hall. Correct - Item 1 CORRECT! A paraphrased example must be cited. You cite a paraphrased example as you would a word-for-word quote. Paraphrasing is a condensed version of another author's work, or putting the author's words into your own words. Take a moment to examine the explanations of the differences between the Plagiarized and Correct versions. Original Source Material: Developing complex skills in the classroom involves the key ingredients identified in teaching pigeons to play ping-pong and to bowl. The key ingredients are: (1) inducing a response, (2) reinforcing subtle improvements or refinements in the behavior, (3) providing for the transfer of stimulus control by gradually withdrawing the prompts or cues, and (4) scheduling reinforcements so that the ratio of reinforcements in responses gradually increases and natural reinforcers can maintain their behavior. Source: Gredler, M. E. (2001). Learning and instruction: Theory into practice (4th ed.). Upper Saddle River, NJ: Prentice-Hall. Plagiarized Version Correct Version Inducing a response, providing for the transfer of stimulus control by gradually withdrawing prompts or cues, reinforcing subtle improvements in the behavior, and scheduling reinforcements so that natural reinforcers can maintain their behavior are the key ingredients identified both in teaching pigeons to play ping-pong and in developing complex skills in the classroom. References: Gredler, M. E. (2001). Learning and instruction: Theory into practice (4th ed.). Upper Saddle, NJ: Prentice-Hall. According to Gredler (2001), the same factors apply to developing complex skills in a classroom setting as to developing complex skills in any setting. A response must be induced, then reinforced as it gets closer to the desired behavior. Reinforcers have to be scheduled carefully, and cues have to be withdrawn gradually so that the new behaviors can be transferred and maintained. References: Gredler, M. E. (2001). Learning and instruction: Theory into practice (4th ed.). Upper Saddle River, NJ: Prentice-Hall. Explanation: This example has been plagiarized. The student has only moved the original author's words around, inserting and deleting small portions as needed. The student has not used quotation marks for the portions that are still identical to the original, and has not credited the original author. Original Source Material: Developing complex skills in the classroom involves the key ingredients identified in teaching pigeons to play ping-pong and to bowl. The key ingredients are: (1) inducing a response, (2) reinforcing subtle improvements or refinements in the behavior, (3) providing for the transfer of stimulus control by gradually withdrawing the prompts or cues, and (4) scheduling reinforcements so that the ratio of reinforcements in responses gradually increases and natural reinforcers can maintain their behavior. Source: Gredler, M. E. (2001). Learning and instruction: Theory into practice (4th ed.). Upper Saddle River, NJ: Prentice-Hall. Plagiarized Version Correct Version Inducing a response, providing for the transfer of stimulus control by gradually withdrawing prompts or cues, reinforcing subtle improvements in the behavior, and scheduling reinforcements so that natural reinforcers can maintain their behavior are the key ingredients identified both in teaching pigeons to play ping-pong and in developing complex skills in the classroom. References: Gredler, M. E. (2001). Learning and instruction: Theory into practice (4th ed.). Upper Saddle, NJ: Prentice-Hall. Original Source Material Student Version There is a design methodology called rapid prototyping, which has been used successfully in software engineering. Given similarities between software design and instructional design, we argue that rapid prototyping is a viable method for instructional design, especially for computer-based instruction. Source: Tripp, S. D., & Bichelmeyer, B. A. (1990). Rapid prototyping: An alternative instructional design strategy. Educational Technology Research and Development, 38(1), 31-44. The student's version shows no evidence of plagiarism. The text is appropriately paraphrased and cited, and the reference is included. Incorrect - Item 2 INCORRECT! The student's version shows no evidence of plagiarism. The text is appropriately paraphrased and cited, and the reference is included. Correct - Item 3 CORRECT! A word-for-word example of plagiarism is one in which the writer directly quotes a passage or passages from an author's work without the use of proper quotation marks. Take a moment to examine the explanations of the differences between the Plagiarized and Correct versions. Original Source Material: Technology has significantly transformed education at several major turning points in our history. In the broadest sense, the first technology was the primitive modes of communication used by prehistoric people before the development of spoken language. Mime, gestures, grunts, and drawing of figures in the sand with a stick were methods used to communicate -- yes, even to educate. Even without speech, these prehistoric people were able to teach their young how to catch animals for food, what animals to avoid, which vegetation was good to eat and which was poisonous. Source: Frick, T. (1991). Restructuring education through technology. Bloomington, IN: Phi Delta Kappa Educational Foundation. Plagiarized Version Correct Version In examining technology, we have to remember that computers are not the first technology people have had to deal with. The first technology was the primitive modes of communication used by prehistoric people before the development of spoken language. In examining technology, we have to remember that computers are not the first technology people have had to deal with. Frick (1991) believes that "... the first technology was the primitive modes of communication used by prehistoric people before the development of spoken language" (p. 10). References: Frick, T. (1991). Restructuring education through technology. Bloomington, IN: Phi Delta Kappa Educational Foundation. Explanation: This example of student written work is plagiarized. The student copied, word-for-word, text from the original source material. No credit was given to the author of the text and quotation marks were not used. Also, the student didn't provide a reference. Incorrect - Item 3 INCORRECT! This is an example of word-for-word plagiarism. A word-for-word example of plagiarism is one in which the writer directly quotes a passage or passages from an author's work without the use of proper quotation marks. Take a moment to examine the explanations of the differences between the Plagiarized and Correct versions. Original Source Material: Technology has significantly transformed education at several major turning points in our history. In the broadest sense, the first technology was the primitive modes of communication used by prehistoric people before the development of spoken language. Mime, gestures, grunts, and drawing of figures in the sand with a stick were methods used to communicate -- yes, even to educate. Even without speech, these prehistoric people were able to teach their young how to catch animals for food, what animals to avoid, which vegetation was good to eat and which was poisonous. Source: Frick, T. (1991). Restructuring education through technology. Bloomington, IN: Phi Delta Kappa Educational Foundation. Plagiarized Version Correct Version In examining technology, we have to remember that computers are not the first technology people have had to deal with. The first technology was the primitive modes of communication used by prehistoric people before the development of spoken language. Original Source Material Student Version During the last decade, there has been a shift from "instructivist" approaches towards "constructivist" approaches in the field of instructional design. Instructivist approaches reflect the belief that the role of knowledge is basically to represent the real world. Meaning is eventually determined by this real world and [is] thus external to the understander. Source: Merriënboer, J. J. van. (1997).Training complex cognitive skills.Englewood Cliffs, NJ: Educational Technology Publications. Plagiarized Version Correct Version Over the last ten years, there has been a marked change from "instructivist" points of view to "constructivist" points of view among instructional designers. Instructivist points of view hold the belief that the role of knowledge is fundamentally to represent the real world. In this view, meaning is determined by the real world and is therefore external to the learner. References: Merriënboer, J. J. van. (1997).Training complex cognitive skills. Englewood Cliffs, NJ: Educational Technology Publications. Instructivists hold that the "real world," external to individuals, can be represented as knowledge and determines what will be understood by individuals. This view has been shifting to a constructivist view over the past decade (Merriënboer, 1997). References: Merriënboer, J. J. van. (1997).Training complex cognitive skills. Englewood Cliffs, NJ: Educational Technology Publications. Explanation: This example has been plagiarized. The student has substituted synonyms for many words in the passage, but has not changed the structure of the text and has used another person's ideas without crediting that person for them. Incorrect - Item 4 INCORRECT! This is an example of paraphrasing plagiarism. A paraphrased example must be cited. You cite a paraphrased example as you would a word-for-word quote. Paraphrasing is a condensed version of another author's work, or putting the author's words into your own words. Take a moment to examine the explanations of the differences between the Plagiarized and Correct versions. Original Source Material: During the last decade, there has been a shift from "instructivist" approaches towards "constructivist" approaches in the field of instructional design. Instructivist approaches reflect the belief that the role of knowledge is basically to represent the real world. Meaning is eventually determined by this real world and [is] thus external to the understander. Source: Merriënboer, J. J. van. (1997).Training complex cognitive skills.Englewood Cliffs, NJ: Educational Technology Publications. Plagiarized Version Correct Version Over the last ten years, there has been a marked change from "instructivist" points of view to "constructivist" points of view among instructional designers. Instructivist points of view hold the belief that the role of knowledge is fundamentally to represent the real world. In this view, meaning is determined by the real world and is therefore external to the learner. References: Merriënboer, J. J. van. (1997).Training complex cognitive skills. Englewood Cliffs, NJ: Educational Technology Publications. Explanation: This example has been paraphrased and the original author has been credited for those ideas. The student has cited the source of the ideas appropriately, and included the source in the reference list. I have read and understand the content of Item 4 [Required] Valid input: - Select only one choice. Original Source Material Student Version Constructivism is a movement that extends beyond the beliefs of the cognitivist. It considers the engagement of students in meaningful experiences as the essence of learning. The shift is from passive transfer of information to active problem solving. Constructivists emphasize that learners create their own interpretations of the world of information. Source: Heinich, R., Molenda, M., Russell, J. D., & Smaldino, S. E. (1999). Instructional media and technologies for learning. Upper Saddle River, NJ: Prentice-Hall. Correct - Item 5 CORRECT! A word-for-word example of plagiarism is one in which the writer directly quotes a passage or passages from an author's work without the use of proper quotation marks. Take a moment to examine the explanations of the differences between the Plagiarized and Correct versions. Original Source Material: Constructivism is a movement that extends beyond the beliefs of the cognitivist. It considers the engagement of students in meaningful experiences as the essence of learning. The shift is from passive transfer of information to active problem solving. Constructivists emphasize that learners create their own interpretations of the world of information. Source: Heinich, R., Molenda, M., Russell, J. D., & Smaldino, S. E. (1999). Instructional media and technologies for learning. Upper Saddle River, NJ: Prentice-Hall. Plagiarized Version Correct Version Constructivists do not hold views entirely opposed to those of the cognitivists. The position of constructivists extends beyond the beliefs of the cognitivist. References: Heinich, R., Molenda, M., Russell, J. D., & Smaldino, S. E. (1999). Instructional media and technologies for learning. Upper Saddle River, NJ: Prentice-Hall. Constructivists do not hold views entirely opposed to those of the cognitivists. The position of constructivists "... extends beyond the beliefs of the cognitivist" (Heinich, Molenda, Russell, & Smaldino, 1999, p. 17). References: Heinich, R., Molenda, M., Russell, J. D., & Smaldino, S. E. (1999). Instructional media and technologies for learning. Upper Saddle River, NJ: Prentice-Hall. Explanation: This example of student written work is plagiarized. The student included a portion of the original author's work in a sentence without using quotation marks. Although the work was cited in the references, no credit was given to the original author in the text of the paper, and quotation marks were not used. Incorrect - Item 5 INCORRECT! This is an example of word-for-word plagiarism. A word-for-word example of plagiarism is one in which the writer directly quotes a passage or passages from an author's work without the use of proper quotation marks. Take a moment to examine the explanations of the differences between the Plagiarized and Correct versions. Original Source Material: Constructivism is a movement that extends beyond the beliefs of the cognitivist. It considers the engagement of students in meaningful experiences as the essence of learning. The shift is from passive transfer of information to active problem solving. Constructivists emphasize that learners create their own interpretations of the world of information. Source: Heinich, R., Molenda, M., Russell, J. D., & Smaldino, S. E. (1999). Instructional media and technologies for learning. Upper Saddle River, NJ: Prentice-Hall. Plagiarized Version Correct Version Constructivists do not hold views entirely opposed to those of the cognitivists. The position of constructivists extends beyond the beliefs of the cognitivist. References: Heinich, R., Molenda, M., Russell, J. D., & Smaldino, S. E. (1999). Instructional media and technologies for learning. Upper Saddle River, NJ: Prentice-Hall. Original Source Material Student Version Major changes within organizations are usually initiated by those who are in power. Such decision-makers sponsor the change and then appoint someone else - perhaps the director of training - to be responsible for implementing and managing change. Whether the appointed change agent is in training development or not, there is often the implicit assumption that training will "solve the problem." And, indeed, training may solve part of the problem.... The result is that potentially effective innovations suffer misuse, or even no use, in the hands of uncommitted users. Source: Dormant, D. (1986). The ABCDs of managing change. In Introduction to Performance Technology (p. 238-256). Washington, D.C.: National Society of Performance and Instruction. Correct - Item 6 CORRECT! The student's version shows no evidence of plagiarism. The portion of the source text is contained within quotation marks and cited with page number, and the reference is included. When major changes are initiated in organizations, "... there is often the implicit assumption that training will 'solve the problem.' And, indeed, training may solve part of the problem." (Dormant, 1986, p. 238). Incorrect - Item 6 INCORRECT! The student's version shows no evidence of plagiarism. The portion of the source text is contained within quotation marks and cited with page number, and the reference is included. Original Source Material Student Version The concept of systems is really quite simple. The basic idea is that a system has parts that fit together to make a whole; but where it gets complicated -- and interesting -- is how those parts are connected or related to each other. Source: Frick, T. (1991). Restructuring education through technology.Bloomington, IN: Phi Delta Kappa Educational Foundation. Correct - Item 7 CORRECT! A word-for-word example of plagiarism is one in which the writer directly quotes a passage or passages from an author's work without the use of proper quotation marks. Take a moment to examine the explanations of the differences between the Plagiarized and Correct versions. Original Source Material: The concept of systems is really quite simple. The basic idea is that a system has parts that fit together to make a whole; but where it gets complicated -- and interesting -- is how those parts are connected or related to each other. Source: Frick, T. (1991). Restructuring education through technology.Bloomington, IN: Phi Delta Kappa Educational Foundation. Plagiarized Version Correct Version A system has parts that fit together to make a whole, but the important aspect of systems is how those parts are connected or related to each other (Frick, 1991). References: Frick, T. (1991). Restructuring education through technology. Bloomington, IN: Phi Delta Kappa Educational Foundation. Explanation: This example of student written work is plagiarized. Although the author is cited at the end of the paragraph, the student copied word-forword from the original source material and did not use quotation marks. Incorrect - Item 7 INCORRECT! This is an example of word-for-word plagiarism. A word-for-word example of plagiarism is one in which the writer directly quotes a passage or passages from an author's work without the use of proper quotation marks. Take a moment to examine the explanations of the differences between the Plagiarized and Correct versions. Original Source Material: The concept of systems is really quite simple. The basic idea is that a system has parts that fit together to make a whole; but where it gets complicated -- and interesting -- is how those parts are connected or related to each other. Source: Frick, T. (1991). Restructuring education through technology.Bloomington, IN: Phi Delta Kappa Educational Foundation. Plagiarized Version Correct Version A system has parts that fit together to make a whole, but the important aspect of systems is how those parts are connected or related to each other (Frick, 1991). References: Frick, T. (1991). Restructuring education through technology. Bloomington, IN: Phi Delta Kappa Educational Foundation. Frick (1991) states that "... a system has parts that fit together to make a whole ..." but the important aspect of systems is "... how those parts are connected or related to each other" (p. 17). References: Frick, T. (1991). Restructuring education through technology. Bloomington, IN: Phi Delta Kappa Educational Foundation. Explanation: This example of student written work is plagiarized. Although the author is cited at the end of the paragraph, the student copied word-forword from the original source material and did not use quotation marks. Original Source Material Student Version Instructional designers typically employ models to guide their day-to-day work. Due to the increased practice of the systematic design of instruction in a growing number of settings, available models become more and more proliferated, focusing on particular types and contexts of learning, particular groups of learners or designers, or particular instructional units (either whole curricula or individual modules or lessons.) The main goal of any instructional design process is to construct a learning environment in order to provide learners with the conditions that support desired learning processes. Source: Merriënboer, J. J. van. (1997). Training complex cognitive skills. Englewood Cliffs, NJ: Educational Technology Publications. Correct - Item 8 CORRECT! The student's version shows no evidence of plagiarism. The portion of the source text is contained within quotation marks and cited with page number, and the reference is included. The paraphrased portion of the source text is also attributed to the source author in the student's version. Incorrect - Item 8 INCORRECT! The student's version shows no evidence of plagiarism. The portion of the source text is contained within quotation marks and cited with page number, and the reference is included. The paraphrased portion of the source text is also attributed to the source author in the student's version. Original Source Material Student Version Theories differ from philosophies and models of teaching. A philosophy is a value system, whereas a theory seeks to explain real-world events and can be certified through scientific investigation. Models of teaching are approaches to the management of some aspect of classroom instruction and they may not be independent of subject area, grade level, age of the student, or the setting for learning. A characteristic of learning theories is that they address the underlying psychological dynamics of events. Thus, they provide a mechanism for understanding the implications of events related to learning in both formal and informal settings. Source: Gredler, M. E. (2001). Learning and instruction: Theory into practice (4th ed.). Upper Saddle River, NJ: Prentice-Hall. Correct - Item 9 CORRECT! A word-for-word example of plagiarism is one in which the writer directly quotes a passage or passages from an author's work without the use of proper quotation marks. Take a moment to examine the explanations of the differences between the Plagiarized and Correct versions. Original Source Material: Theories differ from philosophies and models of teaching. A philosophy is a value system, whereas a theory seeks to explain real-world events and can be certified through scientific investigation. Models of teaching are approaches to the management of some aspect of classroom instruction and they may not be independent of subject area, grade level, age of the student, or the setting for learning. A characteristic of learning theories is that they address the underlying psychological dynamics of events. Thus, they provide a mechanism for understanding the implications of events related to learning in both formal and informal settings. Source: Gredler, M. E. (2001). Learning and instruction: Theory into practice (4th ed.). Upper Saddle River, NJ: Prentice-Hall. Plagiarized Version Correct Version Theories and philosophies are different from each other because theories seek to explain real-world events and can be certified through scientific investigation. Learning theories address the underlying psychological dynamics of events, so they provide a mechanism for understanding the implications of events related to learning in both formal and informal settings. Theories and philosophies are different from each other because, according to Gredler (2001) theories seek to explain real-world events and can be certified through scientific investigation... A characteristic of learning theories is that they address the underlying psychological dynamics of events. Thus, they provide a mechanism for understanding the implications of events related to learning in both formal and informal settings. (pp. 12-13) References: Gredler, M. E. (2001). Learning and instruction: Theory into practice (4th Ed.). Upper Saddle River, NJ: Prentice-Hall. Explanation: This example of student written work is plagiarized. The student used several passages from the original work and inserted them into original prose, however this is still an example of word-for-word plagiarism. No credit was given to the author in the text and quotation marks were not used, and also the work was not listed in the references. Incorrect - Item 9 INCORRECT! This is an example of word-for-word plagiarism. A word-for-word example of plagiarism is one in which the writer directly quotes a passage or passages from an author's work without the use of proper quotation marks. Take a moment to examine the explanations of the differences between the Plagiarized and Correct versions. Original Source Material: Theories differ from philosophies and models of teaching. A philosophy is a value system, whereas a theory seeks to explain real-world events and can be certified through scientific investigation. Models of teaching are approaches to the management of some aspect of classroom instruction and they may not be independent of subject area, grade level, age of the student, or the setting for learning. A characteristic of learning theories is that they address the underlying psychological dynamics of events. Thus, they provide a mechanism for understanding the implications of events related to learning in both formal and informal settings. Source: Gredler, M. E. (2001). Learning and instruction: Theory into practice (4th ed.). Upper Saddle River, NJ: Prentice-Hall. Plagiarized Version Correct Version Theories and philosophies are different from each other because theories seek to explain real-world events and can be certified through scientific investigation. Learning theories address the underlying psychological dynamics of events, so they provide a mechanism for understanding the implications of events related to learning in both formal and informal settings. Original Source Material Student Version Technology has significantly transformed education at several major turning points in our history. In the broadest sense, the first technology was the primitive modes of communication used by prehistoric people before the development of spoken language. Mime, gestures, grunts, and drawing of figures in the sand with a stick were methods used to communicate - yes, even to educate. Even without speech, these prehistoric people were able to teach their young how to catch animals for food, what animals to avoid, which vegetation was good to eat and which was poisonous. Source: Frick, T. (1991). Restructuring education through technology. Bloomington, IN: Phi Delta Kappa Educational Foundation. Correct - Item 10 CORRECT! A paraphrased example must be cited. You cite a paraphrased example as you would a word-for-word quote. Paraphrasing is a condensed version of another author's work, or putting the author's words into your own words. Take a moment to examine the explanations of the differences between the Plagiarized and Correct versions. Original Source Material: Technology has significantly transformed education at several major turning points in our history. In the broadest sense, the first technology was the primitive modes of communication used by prehistoric people before the development of spoken language. Mime, gestures, grunts, and drawing of figures in the sand with a stick were methods used to communicate - yes, even to educate. Even without speech, these prehistoric people were able to teach their young how to catch animals for food, what animals to avoid, which vegetation was good to eat and which was poisonous. Source: Frick, T. (1991). Restructuring education through technology. Bloomington, IN: Phi Delta Kappa Educational Foundation. Plagiarized Version Correct Version History has demonstrated that technology affects education profoundly. Considering the definition of technology broadly, one may say that prehistoric people used primitive technologies to teach skills to their young (Frick, 1991). History has demonstrated that technology affects education profoundly. Considering the definition of technology broadly, one may say that prehistoric people used primitive technologies to teach skills to their young (Frick, 1991). References: Frick, T. (1991). Restructuring education through technology. Bloomington, IN: Phi Delta Kappa Educational Foundation. Explanation: This example has been plagiarized. Although the student has paraphrased the original material and included a citation for the original author, no reference is provided in the reference list. Incorrect - Item 10 INCORRECT! This is an example of paraphrasing plagiarism. A paraphrased example must be cited. You cite a paraphrased example as you would a word-for-word quote. Paraphrasing is a condensed version of another author's work, or putting the author's words into your own words. Take a moment to examine the explanations of the differences between the Plagiarized and Correct versions. Original Source Material: Technology has significantly transformed education at several major turning points in our history. In the broadest sense, the first technology was the primitive modes of communication used by prehistoric people before the development of spoken language. Mime, gestures, grunts, and drawing of figures in the sand with a stick were methods used to communicate - yes, even to educate. Even without speech, these prehistoric people were able to teach their young how to catch animals for food, what animals to avoid, which vegetation was good to eat and which was poisonous. Source: Frick, T. (1991). Restructuring education through technology. Bloomington, IN: Phi Delta Kappa Educational Foundation. Plagiarized Version Correct Version History has demonstrated that technology affects education profoundly. Considering the definition of technology broadly, one may say that prehistoric people used primitive technologies to teach skills to their young (Frick, 1991). Original Source Material Student Version ... constructivist theory rests on the assumption that knowledge is constructed by learners as they attempt to make sense of their experiences. Learners, therefore, are not empty vessels waiting to be filled, but rather active organisms seeking meaning. Instead, knowledge must develop and continue to change with the activity of the learner. It seems clear from remarks of constructivist researchers that constructivist learning goals are best met through a variety of instructional conditions that differ from any proposed by theorists like Gagné. Source: Driscoll, M. P. (2000). Psychology of learning for instruction (2nd ed.). Needham Heights, MA: Allyn & Bacon. CORRECT! A paraphrased example must be cited. You cite a paraphrased example as you would a word-for-word quote. Paraphrasing is a condensed version of another author's work, or putting the author's words into your own words. Take a moment to examine the explanations of the differences between the Plagiarized and Correct versions. Original Source Material: ... constructivist theory rests on the assumption that knowledge is constructed by learners as they attempt to make sense of their experiences. Learners, therefore, are not empty vessels waiting to be filled, but rather active organisms seeking meaning. Instead, knowledge must develop and continue to change with the activity of the learner. It seems clear from remarks of constructivist researchers that constructivist learning goals are best met through a variety of instructional conditions that differ from any proposed by theorists like Gagné. Source: Driscoll, M. P. (2000). Psychology of learning for instruction (2nd ed.). Needham Heights, MA: Allyn & Bacon. Plagiarized Version Correct Version The basic tenet of constructivism holds that learners themselves construct knowledge, rather than receive it from outside themselves. The instructional conditions for learning proposed by Gagne do not support the kind of learning assumed by the constructivists. References: Driscoll, M. P. (2000). Psychology of learning for instruction (2nd ed.). Needham Heights, MA: Allyn & Bacon. The basic tenet of constructivism holds that learners themselves construct knowledge, rather than receive it from outside themselves. The instructional conditions for learning proposed by Gagne do not support the kind of learning assumed by the constructivists (Driscoll, 2000). References: Driscoll, M. P. (2000). Psychology of learning for instruction (2nd ed.). Needham Heights, MA: Allyn & Bacon. Explanation: This example has been plagiarized. Although the student has paraphrased the original material and included a reference for the original author, the ideas are not attributed to the original author in the body of the paper. Original Source Material Student Version An important characteristic of instructional-design theories is that they are design oriented (or goal oriented). This makes them very different from what most people usually think of as theories. Theories can be thought of as dealing with cause-and-effect relationships or with flows of events in natural processes, keeping in mind that those effects or events are almost always probabilistic (i.e., the cause increases the chances of the stated effect occurring) rather than deterministic (i.e., the cause always results in the stated effect). Source: Reigeluth, C. M. (1999). What is instructional design theory and how is it changing? In C. M. Reigeluth (ed. ),Instructional-design theories and models volume II: A new paradigm of instructional theory,(pp. 1-29). Mahwah, NJ: Lawrence Erlbaum Associates. Whether they are probabilistic (i.e., the cause increases the chances of the stated effect occurring) or they are deterministic (i.e., the cause always results in the stated effect), we can think of theories as dealing with cause-and-effect relationships or with flows of natural processes. References: Reigeluth, C.M. (1999). What is instructional design theory and how is it changing? In C. M. Reigeluth (Ed. ),Instructional-design theories and models volume II: A new paradigm of instructional theory, (pp. 1-29). Mahwah, NJ: Lawrence Erlbaum Associates. Reigeluth (1999) states that we can think of theories "... as dealing with cause-and-effect relationships or with flows of events in natural processes," and goes on to say that they may be either "probabilistic (i.e., the cause increases the chances of the stated effect occurring) rather than deterministic (i.e., the cause always results in the stated effect)" (p. 7). References: Reigeluth, C. M. (1999). What is instructional design theory and how is it changing? In C. M. Reigeluth (ed. ), Instructional-design theories and models volume II: A new paradigm of instructional theory, (pp. 1-29). Mahwah, NJ: Lawrence Erlbaum Associates. Explanation: This example of student written work is plagiarized. The student re-organized the original material, and inserted portions of the material in different places within the new paper, but it is still word-for-word plagiarism. Although the work was cited in the references, no credit was given to the author of the text and quotation marks were not used. Incorrect - Item 12 INCORRECT! This is an example of word-for-word plagiarism. A word-for-word example of plagiarism is one in which the writer directly quotes a passage or passages from an author's work without the use of proper quotation marks. Take a moment to examine the explanations of the differences between the Plagiarized and Correct versions. Original Source Material: An important characteristic of instructional-design theories is that they are design oriented (or goal oriented). This makes them very different from what most people usually think of as theories. Theories can be thought of as dealing with cause-and-effect relationships or with flows of events in natural processes, keeping in mind that those effects or events are almost always probabilistic (i.e., the cause increases the chances of the stated effect occurring) rather than deterministic (i.e., the cause always results in the stated effect). Source: Reigeluth, C. M. (1999). What is instructional design theory and how is it changing? In C. M. Reigeluth (ed. ),Instructional-design theories and models volume II: A new paradigm of instructional theory,(pp. 1-29). Mahwah, NJ: Lawrence Erlbaum Associates. Plagiarized Version Correct Version Whether they are probabilistic (i.e., the cause increases the chances of the stated effect occurring) or they are deterministic (i.e., the cause always results in the stated effect), we can think of theories as dealing with cause-and-effect relationships or with flows of natural processes. References: Reigeluth, C.M. (1999). What is instructional design theory and how is it changing? In C. M. Reigeluth (Ed. ),Instructional-design theories and models volume II: A new paradigm of instructional theory, (pp. 1-29). Mahwah, NJ: Lawrence Erlbaum Associates. 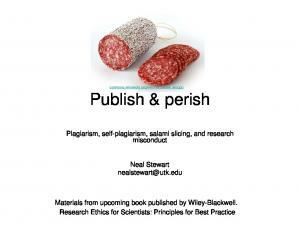 Report "How to Recognize Plagiarism: Plagiarism Test"